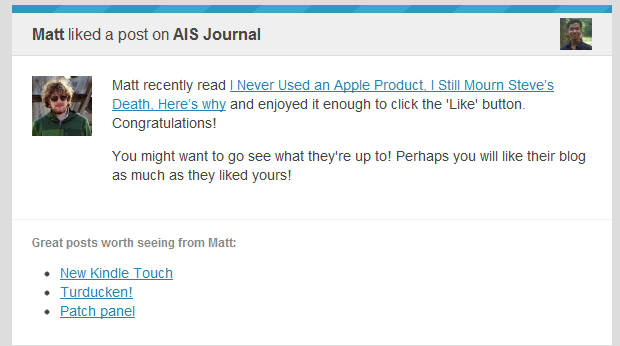 WordPress Founder Matt Liked My Blog! Matt recently read I Never Used an Apple Product, I Still Mourn Steve’s Death, Here’s why and enjoyed it enough to click the ‘Like’ button. Congratulations! Whenever I see the name Matt anywhere on the web, the first ‘full name’ that comes up on my mind is Matt Mullenweg, the person behind WordPress and all things Automattic (like Gravatar, BuddyPress and so on). However, Matt Mullenweg didn’t come up on my mind at first when I received this notification a while ago in my inbox. However, as I clicked the links, I discovered it was indeed Matt Mullenweg, the founder of WordPress! The only time Matt Mullenweg didn’t come up on my mind was the time when it was indeed Matt Mullenweg. How interesting is that? Moreover, I’m way too excited to even think that WordPress founder has been on my blog. Not only that, he liked one of my recent blog posts. This may not be something I can add to my résumé, but it’s definitely something to be excited for! congrats! you write really good! Its really awesome. You are very lucky :). You deserve it. You’re an amazing writer! Wow, great news. You have arrived Sajib! 🙂 Although he is not going to come back (I don’t think so), I find it way too exciting. I WOULD JUST SAY you deserve it!!! I created my blog recently “jestpost.wordpress.com”. And and first post I wrote was liked my Matt and a comment was made by Chris. Do their comments/likes come automatically or I too am lucky? Looks like, unless you got connections, you got lucky.